Mindfulness meditation is a very straightforward type of meditation that is quite easy to learn. This mindful meditation technique will train you to silence negative thoughts and achieve a far more relaxed, calm state of mind. If you are like most people, your mind is probably full of repetitive thoughts. Perhaps some of these thoughts are disturbing or even upsetting to you. This meditation will train you to stop “reacting” to these thoughts, so that they lose their power and begin to fade away. It will leave you feeling far more emotionally balanced. This is one of the main reasons why mindfulness meditation has become so popular with psychologists and other health care professionals. Through the practise of this meditation, you can train your mind to achieve a state of tranquillity, without being disturbed by outside forces. Mindfulness Meditation is a wonderful way to developing this essential skill, so that you can find peacefulness in your life whenever you like. Mindfulness is something you can practice even when you are not meditating, so once you have tried this mindfulness meditation, please take a look at this page on mindfulness, delve into these mindfulness exercises or try some mindfulness activities. These additional exercises will boost the effects of your meditation and really help you to put a stop to that chatterbox in your mind. Please set aside some time to complete this meditation without interruption. Find a quiet place to sit and tell any other people that live with you that you need some quiet time alone to meditate. Please make sure that your phone is off. You don’t need to sit on the floor with your legs crossed for this meditation; your favourite chair will do just fine. Make sure that you are seated comfortably and that your back is straight. If necessary, adjust your clothing so that is loose enough for you to feel relaxed and unrestricted. Close your eyes, and begin to quietly observe your breathing. You may breathe through your nose or your mouth, whatever feels more natural to you. Simply be aware of the in-out movement of your breath. If it helps, you may choose to count your breaths. As you focus on your breathing, remind yourself to relax. This exercise should not be a strain. If you find yourself concentrating too hard, then your body may begin to tense up ... so relax. If thoughts come into your mind, don’t be too concerned. Allow them. Observe them. Let go of them, and return your awareness to your breathing. If an emotion rises up within you, simply observe it. Observe it in the same way that you would observe an everyday sign that you were walking past in the street. You see the sign, you understand it, but you don’t feel any particular attachment to it. Take this same attitude with any emotions. It’s OK to observe them. It’s OK to feel them, but do not label them good or bad and don’t resist them. Just acknowledge that the emotion is present and return your awareness to your breathing. You need not think about that emotion any more, even if it persists. Try this for just five minutes, then try it for ten minutes the following day, then fifteen minutes, then twenty. This mindfulness meditation may seem simple, but it is very effective. Over time it will help you to become much more peaceful, and it will train you to let go of troubling thoughts and feelings very easily. It’s not uncommon for people to say, "I couldn’t do the meditation...thoughts kept coming into my mind." Distractions are normal. The whole point of mindfulness meditation is to learn to deal with these distractions. No matter what arises in your meditation, just observe it and let it go. Picture your distractions as puffs of cloud in the sky. Rarely do they hang around for long. As soon as you return your attention to your breathing, they begin to drift away or evaporate altogether. Whether your distractions arise in the form of thoughts, worries, agitation, negative emotions, desires, drowsiness or doubts, you can begin to release them immediately through this mindfulness meditation. Just continue to apply this practice of observation, letting go, and returning your attention to your breathing. If you practice this meditation daily, you WILL quickly find yourself becoming more and more calm, less bothered by disturbing thoughts and more at peace with yourself. Mindfulness bells are a fantastic tool for developing your mindfulness meditation technique. Now you don't have to go out and buy yourself a special bell. A mindfulness bell recording is all you need. You simply use the sound of a mindfulness bell as the focal point for your mindfulness meditation, rather than focussing on your breath or on a meditation mantra. 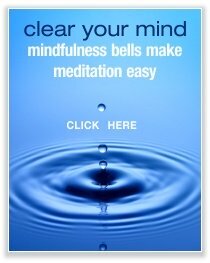 What makes mindfulness bells such an effective tool for mindfulness meditation is the way they fade to silence. When the bell is first struck, you are presented with a sound that is clear and loud enough for you to focus your attention on. But as the sound slowly fades away, your focus on sound is gradually replaced by focus on silence. In this way, your mind is naturally and effortlessly trained to become still and silent, but alert. Mindfulness bells have been used for meditation for thousands of years, and for good reason - they work.